So, I have decided to showcase a couple of guest bloggers so that they can write about things that I don't really have experience with. An NJ tube is one of them. Over the next few weeks, I will be incorporating guest bloggers to write about things like TPN, gastric sleeves, and GP and pregnancy. Thank you in advance for reading my blog and thanks to everyone who is helping me out in this endeavor. It means a lot to me. This article was written by my good friend, Alley Samms. She has several Youtube links that also discuss her NJ tube and she has a store in which she sells gastroparesis jewelry. I met her on one of the many support groups I'm in for GP and she is an amazing woman! She's a very strong person and I'm glad to have her as a friend. My name is Alley Samms. I am 27 years old and have Gastroparesis, and severe GERD, which lead me to get a NJ feeding tube because of malnutrition. I was “wasting away” in my GI’s own words and most likely would not have survived a few more months without some sort of feeding intervention. I have now had a NJ tube for the last consecutive 16 months with no breaks and feeding 24/7. 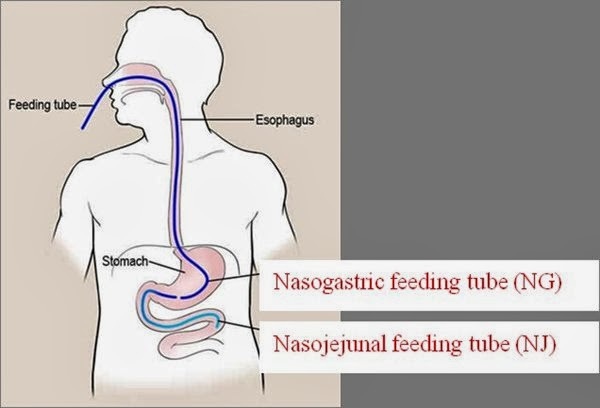 A NJ tube or Nasojejunal Tube is a long tube that is inserted in your nose, follows down thru your stomach and ends in your jejunum so you can feed into your small intestines while by-passing your stomach. Not to be confused with the NG or Nasogastic tube that stops and feeds into your stomach. As we all know feeling into your stomach would be pointless with GP patients. When I got my first NJ (Nasojejunal tube) I was approx. 83 lbs., and severely malnourished. Gastroparesis caused me too much pain and nausea after eating or drinking even water. I could not sustain my health or weight by myself. My GI had suggested I go straight to a J tube for months and I even met with a surgeon who described the tube and how he would make a 9-inch vertical open incision on my belly for placement. I freaked out and told my GI I wanted to trial the NJ tube to see how I do first before I go through such an invasive surgery placement, and boy, I am glad I did. The day of my first NJ placement I was terrified and was NPO (nothing by mouth) for a day already. I arrived at the hospital and sat in the freezing waiting room for about an hour until they finally called me back. I sat in the holding area in the IR department on a hospital bed; they didn’t even have me change into a gown. The first time getting an NJ tube is always the worst, I tell you it gets a lot easier to handle after your first. First I Always bring my own big bottle of water and my own bendy straw, this is very important, also I take 8mg of ODT Zofran about an hour before my replacements/placements just to ease my nervousness about gagging. I sat up in the bed, the nurse tech then told me what’s going to happen (Ha like that will ever help coming from a nurse) and I was about to have a panic attack. They cover the end up the tube which is weighted with lidocaine jelly and insert the end of the tube in my nostril, once they start pushing it in my nose I started swallowing the tube. Now on my first placement like normal for most I gagged so much they had to take that tube out and start over because I could not stop gagging. Lets try this again… Second try, the tech-nurse starts pushing it past my throat, I sip on the water and he gets it all the way into my stomach with me only gagging once. He gave me a big high-five and told me to hold my tube in place until I could get into the Fluoroscopy machine room to have it advanced. I sat there for about 30 minutes holding my tube and joking with the EMT’s that came in and out bringing in people from other hospitals. Finally I got into the Fluoroscopy room. Basically, this is where the Dr. will advance your tube into your jejunum. You lay on a hard table with the “Fluoroscopy” machine, which is taking a constant x-ray to check the placement of the tube. I lie there as the doctor pushes and pulls the tube in and out, laying from side to side until the end of the NJ tube gets far enough past the duodenum. Once the tube is in place, they taped it to my nose (Yuck) and I was on my way home. The first day, like I said is always the worst. I gagged the entire way home, any time I talked and I ended up throwing up a few times without displacing my new tube thankfully. Rest assured this sensation of gagging or chocking will go away in a day or over night. The placement of an NJ Tube. Now fast forward to the not so great experiences with my NJ Tube I have had later down the road. My first bad incident was partially my own fault. I used to leave the “slack” of my tubing hang out of my backpack by my leg and up to my face. Bad idea. My first tube was ripped out violently by my poor puppies paw. I ended up in the ER that day with my sinus cut open and needing a replacement. Always tuck your tubing slack into your backpack if you have kids or animals around. You can even get caught on a door handle, and you do not want that. That brought on issue two that can happen with NJ tubes, or any tubes for that matter: Kinking, coiling and displacement. I got a new NJ tube placed after my dog yanked my first one out of my face. The Dr. who placed my new tube had issues advancing it past my ligament of treitz (for me this is a certain place after the duodenum where my tube will safely stay in my intestines because I have sections of reverse motility). By the time I got home that night and tried to hook up to my feed I noticed I could not flush my tube. Back to the ER I went; yes it was coiled backwards in my duodenum and almost tied into a knot. 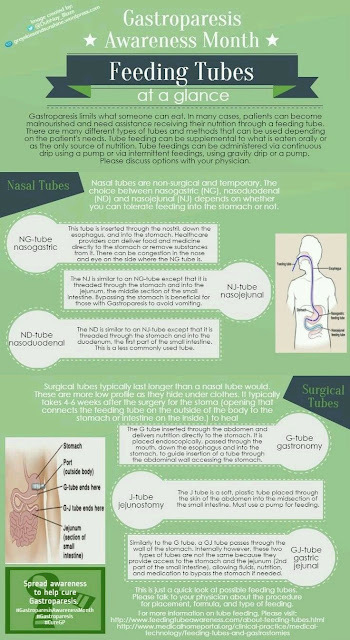 This leads to another great tip for NJ tubes. When my tube kinked, they did not replace it with a new tube, but just un-coiled it by pulling it slightly in and out and pushing it back in further. Do Not Do This! Get a New tube if yours kinks! Tubes, especially small NJ tubes (mine is a 8Fr) have kink memory and once they get kinked, it will kink again soon if not immediately. So, low and behold 3 days later, yup, my tube was kinked and flipped backwards in my jejunum. I don’t quite remember how many tube replacements I have had now, if I had to guess its only about 9 or 10 but that’s over a course of a year and three months. To make your life easier you will learn what works for your body and making living with and replacing tubes a lot easier on you. I have had my share of horrible experiences of tube replacements. My last replacement the Dr. was so pompous and thought he was the best, that he did not listen to me and ended up fracturing my nose and getting the tube stuck in the top tier of my sinus cavity. Extremely painful. I have had it ALL done. I have never been asleep or sedated thru any of my NJ tube placements so I get to enjoy every little moment. However, I prefer not to be sedated because once it is placed there is nothing to really recover from so I can go on about my day as normal. I have had my share of really bad doctors who act like they know what they are doing but don’t when it comes to NJ tube Replacements. I first will tell you my easiest way to get a replacement, then tell you some of the horrors I have been through. First, lay down and have a nurse pull your tube out for you in one smooth motion. Breathe thru your mouth the entire time, I even found humming works too. It takes less than 15 seconds to pull out and its disgusting but not as bad as you would imagine. But do not make the mistake of cheating and drinking something like pedia-sure before you get your tube pulled or else it will be in your nose all day long. It will taste and smell sort of gross like bile but ask to blow your nose and you will be fine. Then, if you trust your Dr. they can do the rest but I Don’t so I ask the nurses to do my placements. Basically as I stated before, sit up, sip water thru a straw then go lay on the Fluoroscopy machine and get it advanced. And breathe thru it all, long breaths out while they push the tube in and out helps. And if it hurts very badly, something is wrong and they need to stop right away. Then tape your tube to your Cheek, not your nose. Taping it to your nose will make you gag more. The closer you tape your tube to your nostril on your cheek the less it will move and bother your throat. Tape I recommend: Hypafix, Durapore, Tegaderm, Tendrgerips and I also get Band-Aids in cute designs and cut the sticky ends off and place them on for some pizazz. If you apply something called “ No sting Barrier Spray” your tape will stick much longer. When switching the tube in nostrils: If there is sharp severe pain STOP the placement. Your nose is deviated and no matter what even if they get it placed you will be in horrible pain the entire time you have the tube. Like myself, I have to keep my tube on the Right side the entire time. I learned that after screaming bloody murder. When a doctor tries to tell you he is going to replace the tube by using a guide wire or another tube as a guide for the new tube, tell them no, or run far away. I speak from too much experience on this and it NEVER works and is miserable to go through. What I mean about guide wire- The Dr. will want to put a guide wire inside your existing tube, keep the guide wire in you while pulling out your tube. He will then slowly pull your tube out inch by inch (takes about 20 minutes or more) Then he will want to keep that guide wire in and put the new tube over it. This is agonizing and very slow. This does not work, you will gag your brains out, vomit and not be able to breathe while you are chocking on your own vomit. Don’t let them do this. Do not let my horror stories scare you away from NJ tubes and their placements. I just have bad luck and have to go to the worst hospital in my town because they are the only ones who will place them here. Not all Dr.s will do this to you, but now you have things to look out for and know the outcomes to better judge your own situation. Clogs: With and NJ tube being so much smaller than all other tubes, it will clog. Depending on what feed you are on, it may clog a lot. Get some SMALL syringes. Under 20mls. I personally use 15ml-5ml-and the occasional 3ml for everyday use and clogs. I do not know why but the 60ml syringe will take 10+ hours or never unclog your tube. If you use a very small syringe it will come out in less than 20 minutes. Upkeep: I have obviously have had an NJ tube much longer than the normal person would normally have one. I get checked by an ENT (Ear Nose Throat specialist) in-between all replacements now to O.K. my sinus for a new tube. I have not had a sinus infection yet at all. My secret: Neti Pot, use when needed, can be used daily but I use it only when I feel gunk building up. Use the Neti pot frequently if you start to get postnasal drip or else the tube in the back of your throat will start getting coated with hardened mucus and will start irritating your throat. The Neti Pot will prevent this buildup. For days your nose hurts, because that will happen sometimes especially if you have severe allergies like I do. Use Affrin Spray, but do not use this more than 4-5 times a month or it can cause more permanent congestion. So only when very needed. When I had my first NJ tube placed I was severely malnourished and 83 lbs. I did start to improve fast after starting NJ feeds. My GI and I agreed after a few months I was responding so well and gaining weight that I may only have to have the tube for a few more months. Well, by the time we discussed the G/J – J tube again I had gained about 15lbs. My Body is one that takes forever to gain but a minute to loose. I can easily loose 5 lbs. in a day with still eating. For example years ago before the tube I had my wisdom teeth removed, I was still eating daily just soft foods and I lost 16 lbs. In a week, my body recovers horribly. So, with that in mind the surgical placement of the G/J – J tube alone would cause me to loose all the weight It has taken me over a year to gain (about 20 lbs. to be accurate) and I would start all over again and I just do not want to do that. I am the lucky one who has little issues living with an NJ tube day to day, no real pain, I forget its there most the time. Because of the NJ tube I am now able to eat orally without pain in my stomach (still have pain in my intestines) so my health has overall improved because of tube feeds and my NJ. My GI’s and I’s goal is for me to reach 110 lbs. and then pull my tube and see how I do, if I start loosing weight I will re insert the NJ tube and basically play it by ear. Thank You for sharing Ally's story. She is a beautiful,strong woman. My 8 y/o son was recently diagnosed and has an NJ Tube..how is Ally, now? Did she reach her 110lbs?